The start of the NASCAR season also marks the return of ROAR! Weekly Race Magazine, published by A.E. Engine. ROAR! 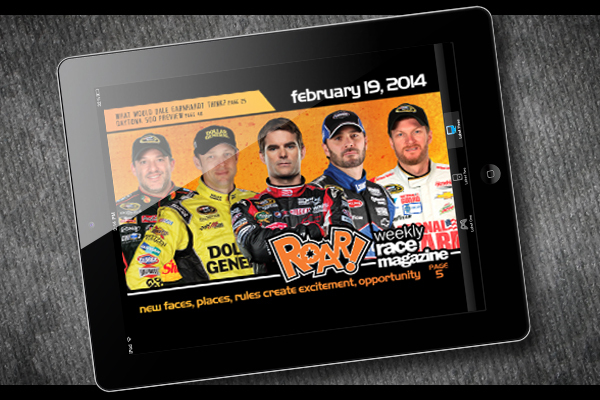 is NASCAR’s first digital magazine that covers the NASCAR race scene on a weekly basis. The magazine, which is available for free to fans who sign up at www.getroar.com, is available for mobile phone, tablets and computers. Published weekly, ROAR! provides both review and preview content along with schedules and results. Each issue is more than 75 spreads in size (150 pages) and is delivered to fans every Wednesday via email or the app.